At 6’4’’, 225 pounds, Patrick Maroon is tough to miss out on the ice. But, if his imposing physical stature wasn’t enough to make the hockey world take notice, his stellar debut with the London Knights in the OHL has been. Maroon has emerged as one of the most pleasant surprises in the Flyers’ system this season. Selected by the team in the sixth round (161st overall) of this summer’s NHL Entry Draft, the St. Louis native presently leads the perennially-elite Knights and all OHL rookies in scoring. Arriving in London after a pair of dominating campaigns for the Texarkana/St. Louis Bandits in the NAHL, Maroon was originally expected to play college hockey at Ferris State University. He was recruited heavily, however, by former NHLers Mark and Dale Hunter of the Knights to play at the Canadian major junior level, a decision that few can question now. Along the way, the 19-year-old power forward has battled weight and conditioning issues, but now appears to be on the right track. Maroon has cemented his status as a legitimate NHL prospect with his great start in London. His standing within the Flyers organization was also confirmed when the team signed him to a three-year entry level contract on November 1. Born in St. Louis, Missouri on April 24, 1988, Maroon grew up around the game. Raised in a family that was very passionate about hockey, he began playing at a young age, excelling from the start on the ice and on the roller court. “My family has been the biggest influence on my career,” he explained. “My parents have always been so dedicated and my brothers were always into the game, and helped me along. I owe a lot to them, obviously. Maroon, like many young players raised in larger cities, grew up playing inline hockey. He established himself as one of the nation’s top young players on the court, leading Oakville to a Missouri State Championship, and going on to play for a number of St. Louis-area entries at NARCH tournaments (North American Roller Hockey Championships). “I love playing the game on the ice and inline,” he said. “I spent my summers growing up playing in roller hockey leagues and in tournaments, and I think it helped me develop into a better player and really helped my skills. Back on the ice, Maroon was a standout player at Oakville High School in St. Louis, then moved on to play for the St. Louis Junior Blues at the Midget AAA level. Thanks in part to his size and physical dominance he garnered a great deal of attention from scouts who came through the Midwest looking for talent. 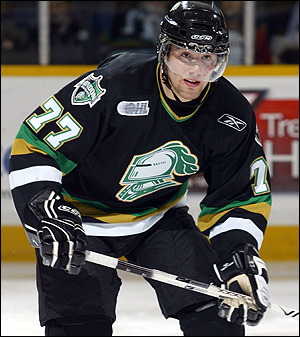 In 2004, he was selected by the London Knights in the 11th round (220th overall) of the 2004 OHL Draft. It was not known at that time whether Maroon would ever actually move to Canada to join the team, or even play hockey at the major junior level. As he prepared to make the jump to the Junior A (Tier I) level, college seemed like a more likely scenario. Maroon joined the NAHL’s Texarkana Bandits for the 2005-06 season, debuting in a circuit well-known for feeding talent to the NCAA. He enjoyed a very strong campaign, tallying 60 points (23 goals, 27 assists) and 61 penalty minutes in 57 games. However, he would also endure some criticism for what were perceived to be poor dietary habits and a lack of proper conditioning. It was assumed by most observers and members of the Bandits coaching staff that Maroon could dominate the circuit if he could get into better shape. The then-18-year old forward took the advice he was given to heart, and engaged in a rigorous summer regimen that saw him drop an astounding 35 pounds prior to the start of the following season. Interestingly, the offseason also saw the Bandits leave Texarkana to move to Maroon’s native St. Louis. Maroon went on to enjoy a banner season, becoming the first Bandit in the four-year history of the franchise to win the NAHL’s MVP award. He led the league in scoring with 95 points (40 goals, 55 assists) and 152 penalty minutes in just 57 regular season games, then added 23 points (10 goals, 13 assists) in 12 playoff contests, en route to leading the team to the Robertson Cup championship. Bandits head coach Jon Cooper readily agreed. Part of Maroon’s motivation for improvement during his second season with the Bandits was the fact that he was passed over at the 2006 NHL Entry Draft. His hard work and performance in leading the team to the NAHL championship, assured that he would be selected in his second year of eligibility, however. As the 2007 version of the event commenced, speculation had Maroon landing with his hometown St. Louis Blues, but as the draft wore on, he continued to sit and wait. Finally, Maroon learned that his name had been called by the Flyers in the sixth round. There was still some question at the time, however, as to where Maroon would be playing in 2007-08. During his time in the NAHL, he had committed to play NCAA hockey at Ferris State. 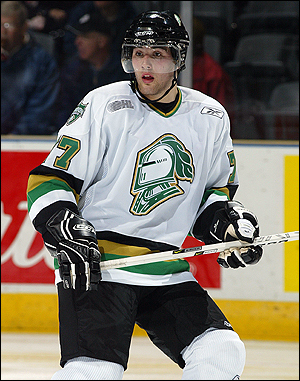 But his emergence with the Bandits and improved conditioning status resulted in the Hunter brothers pushing hard for him to continue his career in the OHL for the London Knights. Though the decision was admittedly a difficult one, he chose the latter. Prior to joining London to start his major junior career, Maroon made his first two trips to Philadelphia, to participate in the Flyers’ rookie and main training camps. He also suited up for action in one exhibition game with the Phantoms before being reassigned. Maroon arrived in London to a team struggling to find its identity. Though considered one of the elite major junior programs in the world over the previous half-decade or so, the Knights suddenly had more question marks than answers. For starters, the team had lost top prospects Patrick Kane and Sam Gagner - the first and sixth overall selections in the 2007 NHL draft - to the pro ranks. An influx of new talent was needed, and Maroon was certainly a big part of the Hunter brothers’ plan. The Knights got off to a dismal 0-6 start, but as the younger players on the team become more acquainted with their settings, they began to turn things around. The most impressive rookie, by far, has been Maroon, who made a terrific transition and has helped fuel the team’s turn around. Amazingly, the team now sits in second place in the Midwest Division with a record of 18-9-0-2. The Knights’ 38 points rank them fourth in the league. To date, Maroon leads the team and is pacing all first-year OHLers in scoring with 39 points (16 goals, 23 assists) in 27 games. He has been a consistent offensive contributor from the get-go, also leading the Knights with nine power play goals and boasting a plus-six rating. Maroon has been equally effective as a goal scorer and set-up man. He has developed a very strong chemistry with third-year OHLer and first-year Knight Akim Aliu, who was chosen by the Chicago Blackhawks in the second round (56th overall) of the 2007 draft. “We’re happy to have him,” said an enthused Mark Hunter, the Knights General Manager, who also praised Maroon as a physical presence for the team. “But it isn’t just [Maroon’s] size. He has good hands, good skills. He can pass the puck. He’s a go-to guy, and that is something we need. "He's a difference maker. He can beat guys one-on-one. There are some things he needs to clean up. He needs to get himself in better shape and then his skating will get better but he's working on it." Maroon was named the OHL Rookie of the Month for October, after recording 20 points (10 goals, 10 assists) in 11 games during the month. He also enjoyed six multiple-point games in that span, including a three goal, two assist performance in an 8-2 win over the Ottawa 67s on October 14. He followed that up by notching three straight two-goal games, part of a stretch in which he scored 17 points in a seven-game scoring streak. On November 1, Maroon signed a three-year entry-level deal with the Flyers, confirming the organization‘s faith in his potential and satisfaction with his development thus far. "We are excited about having him as a part of our organization," said Holmgren in making the announcement. "We will continue to watch him and see how he does. We look forward to him continuing his strong start in London." In the past year, Maroon has gone from questionable prospect to OHL impact player with an NHL entry-level contract in his back pocket. It has been a remarkable ascension, but everyone in Philly and London, as well as Maroon himself, realizes that he still has a lot of work to do. Though he has emerged as an offensive force for the Knights, there are still several areas in which the towering forward needs to improve, including skating and his play in the defensive end. There is also the matter of consistency. While Maroon has come flying out of the gates in his first three months in the OHL, he has yet to prove that he can maintain a steady pace throughout the season at this level. “I would say that skating is the biggest thing for me right now,” said Maroon, when asked what he has to improve upon most. “That, and I still have to be careful with my conditioning, and work hard to stay on the right course. Beyond this season, the future remains wide open for Maroon. At this stage, even if he continues to put up big numbers for the Knights, a return for at least one more campaign would seem likely. After all, while he is undoubtedly skilled, his overall game still isn’t polished. He will, however, turn 20 by the time the 2008-09 season rolls around, and will thus be eligible to play in the AHL for the Philadelphia Phantoms. Either way, continued success this year and a very strong training camp next fall will be essential to his future success. “Patrick, because of his hockey sense and his ability to do things with the puck and make plays and score, makes him a good prospect,” said Holmgren.